Over the last few years I have learned to play guitar and performed in different situations. From the start I've had many fears about what I did. Will I be able to learn this? What will people think? Will they appreciate it? Will they make fun of me? I feared what the people that listened to me play guitar would say to me or think about me and my music. The good news is that despite this fear I have learned to play over 50 songs and received appreciative feedback for many performances. So what does this have to do with you as you learn guitar? A lot. We all experience fear at some point whether we're just starting to learn guitar or already play and are scared to move forward and do something new. If you let this fear control you then you are not going to realize your dreams. The question is not whether or not you will experience fear as you learn guitar. The question is how will you react to it. Imagine you are standing on the slopes of a mountain when a large rock comes rolling down towards you, what would you do? The right reaction is of course to get out of the way as fast as you can before the rock hits you. This little exercise illustrates that it's OK to feel fear, but you musn't allow your fear to paralyze you where you stand now. So, there is a right and a wrong reaction to fear. 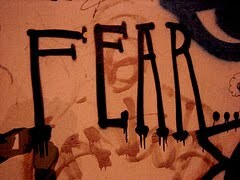 Fear is a natural part of life, it is your reaction to it that determines how well you will do. The right way to deal with fear is to recognize what it is you fear and take action to move forward anyway. The wrong way to deal with fear is to let it paralyze you. Don't confront it, don't move forward. A lot of people have the equipment they need to learn guitar, they have the books, videos or teacher but never move forward. They have access to all the training needed to learn to play guitar but they never do anything with it because of fear. New experiences are always a bit scary. And challenging yourself to progress and learn to play better guitar will introduce an element of fear. But to move forward you have to overcome the fear and take the necessary actions to learn anyway. So, what are the fears stopping you from playing better guitar? Can you identify them? Will you confront them and move forward anyway? Or will you avoid them and not try new things, skip practice, or give up learning guitar altogether? Photo by Jimee, Jackie, Tom & Asha.